The kitchen ventilation fan hood enhances the air circulation power of the fan system and provides local absorption of a significantly higher level. Therefore, homeowners who enjoy preparing meals on a regular basis should definitely consider this brilliant appliance. It is important to note that this article refers only to updraft ventilation systems and the necessary steps in installing on in a DIY fashion. Although models may vary, it is safe to say the basic kitchen ventilation fan hood installation principles are overall similar. On a side note, a proper job ensures the maximum performance in air filtration and recirculation. 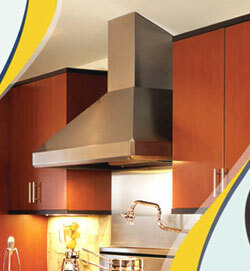 The air entry position should be decided based on the future location of the range kitchen ventilation fan hood. Therefore, this part of the task implies placing the range on the kitchen cabinet that it will be attached to and marking the location on the wall in pen. Following, the installer should cut a hole large enough to fit the air entry of the duct in the said wall and an additional one for the air exit end. In order to fit the ducts components together, it will require some tapes and metal foil insulation. Once the duct system is up and running, it is time to add the range kitchen ventilation fan hood. In order to do so, homeowners should disassemble the filters and the lighting system and connect the range hood to the entry point of the ductwork. Furthermore, a second hole in the wall should be made in order to account for the power cord of the ventilator. Attaching the hood to wall can be done with the aid of screws or bolts. Next, it is time to install the filters and the lighting system which have been disassembled in step 2 and connect the kitchen ventilation fan hood to the electrical system. Turning on the hood ventilator is required in order to verify whether it has been installed properly. Ensure that the external hole punched in the exterior wall-side or roofing has not left the home exposed to the elements can be achieved by insulating the flange with the aid of caulk. Alternatively, tar works equally well for this task. However, slipping the flange underneath the upper shingles is a necessary step before applying the sealant coating.